This recipe requires a slow cooking process at low temperatures. It takes as many lobsters as there are guests. Pick the small ones, Chausey blue lobsters are the best. You would rather choose from a selection of white wines: Montlouis, Jasnières, St Péray, Chablis 1er cru, Chassagne Montrachet, Pouilly-Fuissé. Do not forget South African wines such as the Chenin Blanc 2013 “Family Reserve” Kleine Zalze and Baroness Nadine de Rupert & Rothschild. • Clean the lobsters, take off the remaining speck, leave the elastic bands or replace with tight natural raffia. • Rinse the tarragon, remove excess moisture and dispose on an aluminum foil directly on the oven’s bottom. 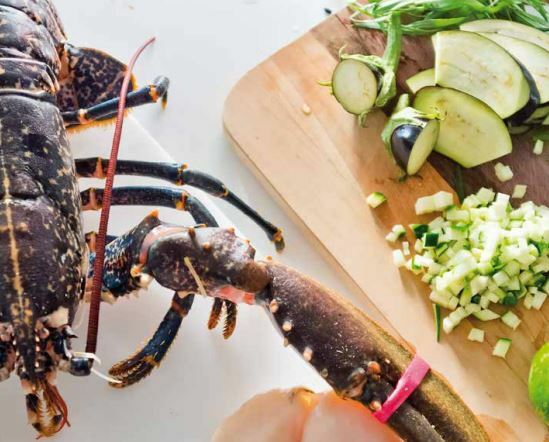 • Dispose live lobsters on the grill above the tarragon inside a cold oven and set the thermostat to 60 ° C.
• Cook for 45 minutes, the lobster is going to fall asleep with the rising heat of the oven, the elastic ties fear nothing at this temperature. Place the lobsters on plates, each guest will have the pleasure of opening his crustacean and enjoy the delicately flavored flesh. Finger licking is part of the pleasure of tasting. Depending on the season, you will accompany your lobster with a dish of fresh pasta with cream and fresh scallops or a well-stewed ratatouille.